Its been a bit quiet on the PR front at OpenAV recently – so here an update on what’s all been going on. Apart from a nice relaxed holiday for the new year and some brain storming on new and cool ways to improve live performance, we’ve been prototyping how to have Ctlra library handle screens best… the result speaks for itself: see the banner image above! As you can see, ~120 commits to prototype new APIs, callback methods, and how to best support “partial redraw” of the screens – a difficult feature but required for high FPS updates to screens over USB cables. 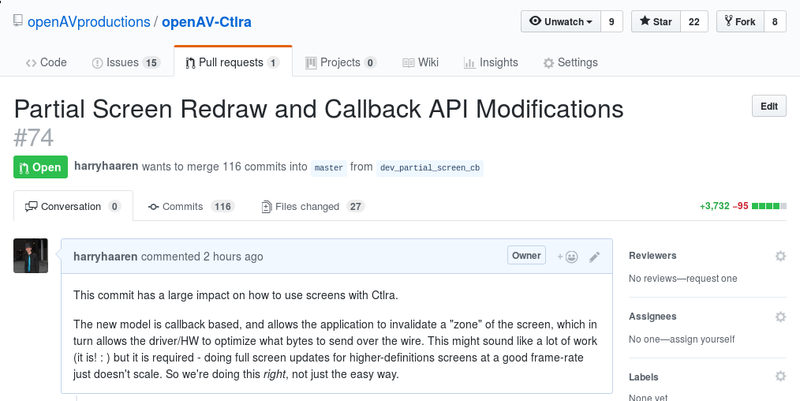 Of course, our very own AVTKA now also has partial-redraw support – it indicates what area of the screen has been repainted, so Ctlra can make use of that information to optimize your screen refresh! Long story short: we’re doing this the right way instead of the easy way. We understand that its not exactly “user visible” work right now – we’re hoping to change that very soon and start creating and releasing Ctlra enabled applications suited to become the core of your next live-performance setup! Next post 06: Its Almost LAC 18!